The yearly WWE video game release has been the platform that laid the groundwork for some big returns to the company over the past few years; in 2012 Brock Lesnar made his first appearance in years with WWE in that year’s game before eventually making his in-ring return a few months later, then last year The Ultimate Warrior made his first WWE appearance in over 17 years when he filmed a commercial for the game and was a playable character as well. 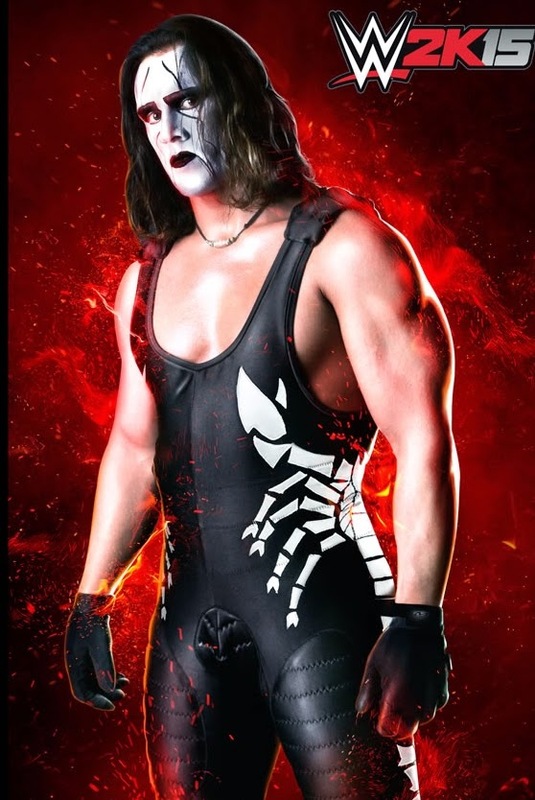 This year WWE’s 2K15 video game will feature a legend that has never appeared in a WWE ring….until now, as it has been announced that “The Icon” Sting will be appearing in his first ever WWE game as a pre-order bonus character. Sting has been the lone figure in wrestling that always remained true to WCW throughout his career; while others went back and forth between promotions in the 90s, Sting was THE WCW guy that never wavered. When WCW closed in 2001 and many talents from WCW attempted a WCW run, Sting always held back and realized that he may not be used to his full potential. In recent years, while Sting has competed mainly in TNA, every year there has been a growing up that Sting would finally jump ship and hopefully take on The Undertaker in a dream WrestleMania match. The past few months the speculation of Sting finally joining WWE for a final run have really heated up with many rumors stating the wheels were in motion to finally get a deal signed, but The Undertaker’s shocking loss to Brock Lesnar at WrestleMania 30 has people questioning if The Undertaker may be completely done which would in turn leave the Sting dream match in limbo. Thankfully, as the Sting WWE 2K15 promo aired on RAW tonight, we at least have the first step in what could finally be a run for Sting in WWE. While this technically doesn’t mean Sting will wrestle in WWE, it sure is a huge step toward it especially since WWE presented it in the middle of RAW and created a huge buzz in the arena and for fans at home. It’s really rare that a star the magnitude of Sting has never stepped foot in a WWE ring, so that happening still has a bit of magic behind it and the promo undoubtedly gave that vibe as well. Above all else, this promo is awesome and features an orchestra performing Sting’s signature theme song from the height of his WCW popularity. Not only that, but the game will feature two versions of Sting: the “crow” style sting he’s used in recent years as well as the old school blonde “surfer” style Sting! Check out the full promo for Sting’s WWE debut in 2K15, and pre-order the game to receive Sting as a playable character! Randy Orton Kicks Vince McMahon in the Head, Ushers in a New WWE Era? Will Fandango Be the Star of WrestleMania 29?